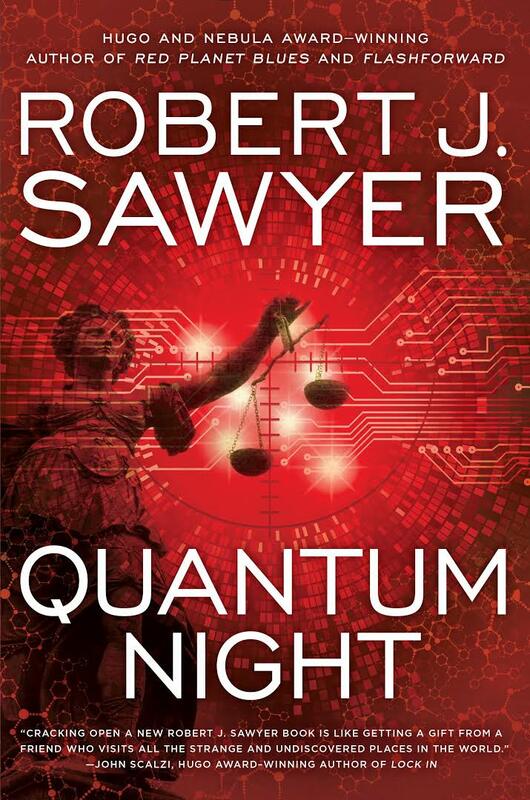 Robert J Sawyer’s, Quantum Night, is a near-future, SF thriller that explores the world of quantum physics and its impact on human consciousness and personality. It is set in 2020 Canada, where Justin Trudeau has just resigned as Prime Minister, to be replaced by a popularly elected Muslim, Naheed Nenshi (who is a real-life Canadian politician). Over the border the American President, Quinton Carroway, elected on an anti-Muslim, anti-Latino platform (sound familiar? ), is not happy with the new Canadian “socialist” regime. This sets up the background story of an emerging global conflict that looks to spiral out of control, with disastrous consequences. The references to current world affairs are very evident. Vladimir Putin is still President. Of course, I suspect Quantum Night was written before Brexit and before Trump’s election (which I’m sure was an impossibility to any Canadian writer) and shows the dangers of writing near-future fiction: it becomes outdated quickly and loses the “realism” that references to current events might bring, especially when they are wrong or non-existent. Still, Quantum Night is an interesting novel. The main protagonist is Professor James Marchuk, who teaches psychology. Marchuk is called as a witness in the sentencing of a prison guard found guilty of torturing and murdering an inmate. The death penalty will be imposed unless he can convince the jury otherwise because of his expertise in detecting psychopathology. He takes the stand and, under cross-examination, finds that he can’t remember six months of his life during his time as a student at the University of Manitoba, thus setting off a set of events that form the core of the novel. Sawyer is writing to his strengths, and Quantum Night is heavily researched to give it scientific authenticity. For example, he includes a number of interludes where Marchuk engages his psychology students about actual psychology experiments well known in the field. This information is all important to the telling of the story, but makes the book feel at times more like a lecture than a work of fiction. But it is engaging and easy to read, so long as one does not ponder too long on the hard science. As a near-future fiction, it has lots of signposts and cultural references (Coke Zero) to give the story a familiar milieu. However, the many pop culture references that litter the story, from Boy George to Star Trek and beyond, are, at first, quaint, sometimes funny, but after a while start to irritate. As a reader of 50 plus years of age, I got most of them, but I suspect many younger readers may not. Also, I can’t help but think Sawyer is having a bit of fun with US and Canadian relations and politics. If you like your SF hard and close to home, Quantum Night is worth the read. And if you want to learn about Utilitarianism, then this is the book for you!